Things don't move too fast in rural communities like New Cuyama, and they especially slow down when the midday sun bears down and the heat hits the high 90s. That is, except for Louie, the pit bull/black lab mix who bounded after a small lizard darting for the safety of the nearest desert shrub on the Blue Sky Center's land. 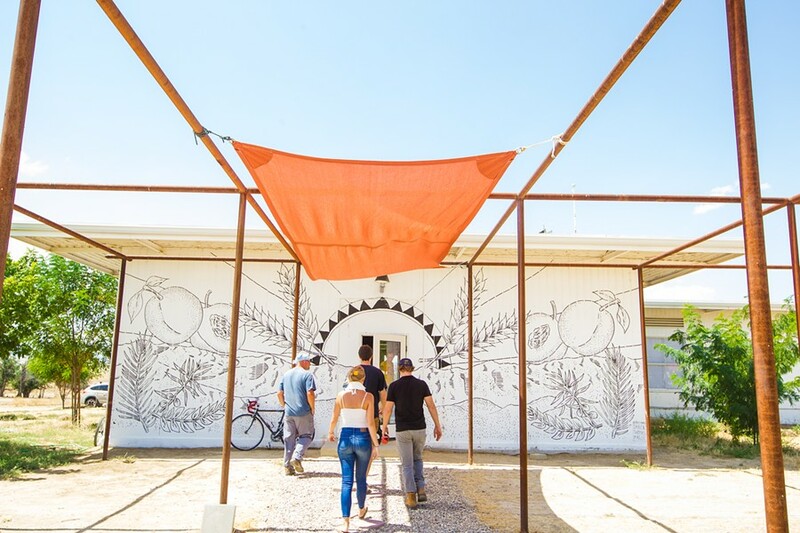 REACHING THE SUMMIT In May, the Blue Sky Center in Cuyama hosted the two-day Rural Summit, during which artists, students, government officials, nonprofits, and community members shared meals and gathered momentum for making positive changes in the town. Blue Sky's Development Director Emily Johnson was walking across the nonprofit's property at a slow but deliberate pace, explaining all the different things that happen there while Louie ambled along. The "high desert" climate in northeast Santa Barbara County's Cuyama Valley is part of the draw for the tourism aspect of the nonprofit's mission to empower the valley's communities, she explained while approaching a row of canvas-roofed huts. The Blue Sky Center rents the custom-crafted huts out on travel booking websites like Airbnb or Hipcamp for those who want to enjoy the seclusion and natural beauty in New Cuyama, Johnson explained. "I think that's really the lifestyle that we're trying to project here is that desert lifestyle, so we have these unique huts that really have the frontier ethos," she said. "We have campers that come from all over the world; it's actually surprising sometimes. We have people from Japan and Australia to Sweden and Germany." But Blue Sky is about much more than attracting tourism dollars to the isolated valley. The nonprofit's mission is to "regenerate the land, economy, and communities within the Cuyama Valley," which, Johnson said, takes a multi-tiered approach that engages the community, its businesses, other nonprofits, and representatives directly. The nonprofit took a big step toward its goal in May of this year, when it held what was called the Rural Summit, which brought outside experts and collaborators to speak and engage directly with Cuyama's business and agricultural leaders, educators and students, artists, other Santa Barbara County nonprofits and foundations, and representatives including State Sen. Hannah-Beth Jackson (D-Santa Barbara) and Santa Barbara County 1st District Supervisor Das Williams. There were panel discussions, demonstrations, shared meals, and discussions over the campfire, all aimed at addressing the question: How can the Cuyama Valley's economy and community empower itself and thrive? MAKING IT HAPPEN The Blue Sky Center's team includes Executive Director Philip Jankoski (second from right), Development Director Emily Johnson (not pictured), Facilities Manager Chris Budny (right), and AmeriCorps VISTA members Julia Warner (left), Elise Dixon (second from left), Ryan Flanagan (center), and Matthew Simeone (not pictured). Most of New Cuyama was built in the 1950s after oil was discovered in 1949 and the Atlantic Richfield Company, or ARCO, set up shop there. In the late 1970s, however, the big oil company moved on, leaving the town it built behind. The community in New Cuyama enjoyed a high standard of living during the oil boom, Blue Sky Executive Director Philip Jankoski explained, but that declined after the company left and New Cuyama lost its "single-source economy." Now, agricultural companies are pretty much the only game in town. The Blue Sky Center is located at the former headquarters of the oil company, which include a single-story office building, an industrial complex, storage, acres of open and unused land, and even a runway that the nonprofit maintains for public use. "People can fly in, and we get quite a few pilots on the weekends who come in for lunch at the Buckhorn," Johnson said. The property was acquired in 2012 by the Zannon Family Foundation, which was established by Gene and Gail Zannon, owners of the Santa Barbara Organic Pistachio Company, which operates and grows in the Cuyama Valley. The land and buildings were derelict, Jankoski said, and Blue Sky is still working on restoring all the facilities. The center received 501c3 nonprofit status in 2015, which is when Jankoski came on board as executive director. The Zannon Family Foundation wanted young people to make up the board and staff, Jankoski explained, to move the organization forward and eventually reach a point when the nonprofit could be self-sustaining. "We do have an active and engaged board of directors, Em [Johnson] and I are both millennials, and we have four millennials that just joined us through AmeriCorps VISTA," he said. "The foundation has really transferred a lot of their wealth and resources to help get this organization off the ground, and now we're independent." Actually addressing the numerous problems that afflict rural communities like Cuyama starts first with identifying them. Blue Sky has pulled from local, state, and federal agencies to help recognize the problems affecting the valley. They found that Cuyama has the highest childhood poverty rate in Santa Barbara County based on free or reduced meal eligibility. The valley is also considered a food desert due to the lack of a supermarket. Residents need to drive at least an hour to Santa Maria, Nipomo, or to Kern County to buy affordable fresh produce. There's also a serious lack of not just affordable but available housing, especially for the valley's agricultural workers. Many of those workers have to live elsewhere and commute to the valley, Jankoski and Johnson explained, so most of the money that's made in the valley is spent elsewhere. That further compounds the economic hardships in the Cuyama Valley, they said. The center's AmeriCorps VISTA (Volunteers in Service to America) members are currently staying at a home in New Cuyama. They've worked to meet gaps in the U.S. Census report on the Cuyama Valley, knocking on doors to figure out how many people live in the town, what kind of needs they have, and where they're underserved. The issues the Cuyama Valley faces are mirrored in rural communities nationally. According to the U.S. Department of Agriculture's Poverty Overview, the poverty rate in nonmetro areas was 17.7 percent in 2012 as recorded by the American Community Survey, the highest recorded rate since 1986. The poverty rate for metro areas for the same year was 3 percent lower. The higher rate of poverty in rural areas compared to urban areas has been consistent, according to the overview. The way Blue Sky hopes to approach those issues is based on community engagement and empowering local residents and stakeholders to address the problems by collaborating with each other and the nonprofit. The center can act as both a catalyst and as a community hub for fostering those partnerships, Jankoski and Johnson explained. There are a few pillars on which they base their mission: rural tourism and hospitality for economic revitalization, food systems and agricultural development, educational outreach to schools and businesses, and "creative placemaking" to utilize arts and artists that can give voice and identity to the valley's culture and supplement the value of the properties there. At its heart, the Rural Summit was a convergence of all those principles, as people who had never been to Cuyama came to visit for the first time to share knowledge with all the valley's business stakeholders, educators, students, and local representatives. The crowd at Blue Sky Center on May 12 and 13 was much larger than usual. All of the canvas huts were rented out, so visitors stayed in other places, like the motel at the popular Cuyama Buckhorn steakhouse and saloon. There were presentations by artists, roundtables and brainstorming sessions, discussion panels, storytelling by Cuyama's students, and meals where everyone broke bread together. The event made the center the community hub it was designed to be. 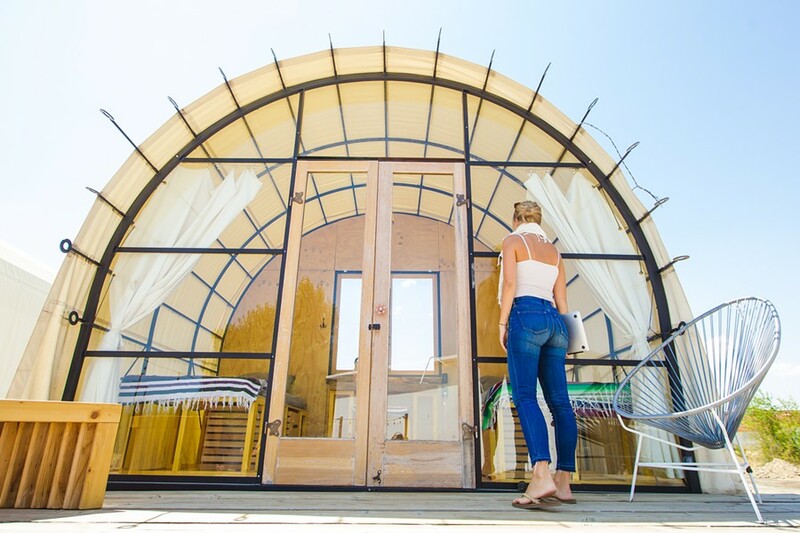 PLACE TO STAY The Blue Sky Center rents out canvas-roofed huts on Airbnb and Hipcamp to help support the nonprofit financially while also attracting tourism dollars to the small town of New Cuyama. "We really wanted to pool together all the sectors, stimulating public and private partnerships, stimulating stakeholder partnerships in the valley with the growers, including the youth and academic leaders, including artists and designers who know how to utilize the arts to communicate solutions and to communicate a shared mission," Johnson said. Getting everyone at the same table was important, Jankoski and Johnson explained, especially in sharing something as intimate as a meal. Literally, at a gathering around the campfire, ideas, art, and plans for the future were shared. Photographer Noe Montes projected a digital slide show in the twilight. The presentation featured photos Montes captured while spending time in a community of farmworkers in the Coachella area. "I've been working with [Blue Sky] for a little less than a year now," Montes told New Times. "I think my function with the Blue Sky Center is to be a liaison to that community to the extent that I can and bring my experience working with the underserved farmworker community to the work that Blue Sky is doing." Some of that work includes affordable housing for farmworkers. Santa Barbara County Supervisor Williams, whose district includes the Cuyama Valley, said the area is in serious need of farmworker housing. It's an issue he's working with the center to address. "We're planning on trying to get some affordable housing development done on a portion of Blue Sky's land," Williams said. "So that would be of great benefit to both local residents and local agricultural companies. "One of the things we're planning on doing is to change the regulatory process for farmworker housing," he added, "not just for Cuyama, but doing it countywide." The panel discussion with agricultural stakeholders was an important part of the event as well. The panel included those from some of the larger-scale farms in the valley to staff from mid-sized organic operations, all the way to small family farms. Juan Calderon, the ranch manager for Duncan Family Farms, was there to speak about some of the programs the company has established with Blue Sky, as well as to connect with everyone who was there. "I think it was a great opportunity to be more engaged in the community and meet other people," Calderon said. "The company wanted to know: How can our focus and culture extend to the community?" Agriculture wasn't the only food-focused panel at the summit—there was also the matter of food availability in the Cuyama Valley. Partners in the Santa Barbara County Food Action Plan were part of a panel, including the Foodbank of Santa Barbara County and the Santa Barbara Foundation. Blue Sky has been involved in the Food Action Plan as a partner as well, Foodbank CEO Erik Talkin* told New Times, and the Rural Summit was a good chance for partners in the plan to put their heads together. 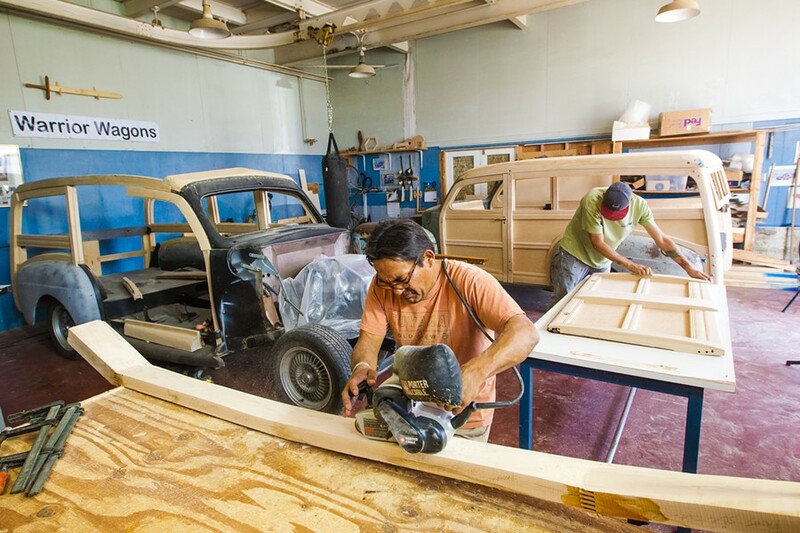 ACTING LOCALLY Alexander Guerrero owns Warrior Wagons, his business for restoring classic woody car bodies, and rents a workspace at the Blue Sky Center, which is mere blocks away from his home in New Cuyama. "We feel that in New Cuyama, but in any community, if you can try and link the work of nonprofits to a broader community development purpose, that the work that you do is more long-lasting and deep," Talkin said. The Santa Barbara Foundation's senior director of community investments, Sharyn Main, was a part of the panel, too. The foundation is a partner in the food action plan and gives support to Blue Sky, including as a sponsor for the Rural Summit. "Because of the work they are doing and the way they're positioned in the middle of that community, they have an opportunity to really bring together a lot of different sides," Main said. "We thought it sounded like a perfect venue to have this conversation." Those discussions didn't fall on the ears of just nonprofits and business people. State Sen. Jackson said she came to the Rural Summit to listen, first and foremost, to the needs and wants of Cuyama Valley residents. But the summit was also a chance to get a view of the path toward improving life in the area and other rural areas in her district and the state, she said. "This center is really very innovative," Jackson told New Times. "I think innovation is a critical word: How do we create economic viability and economic robustness in an area that is really so rural, so disconnected if you will, from the economic and educational centers that are usually necessary for an economy to grow and thrive and develop?" The presence of both Cuyama Valley educators and students was important to the rural summit as well, Jankoski and Johnson said. A handful of students involved with the Cuyama Future Leaders read from writing projects they had prepared, which shared their experiences growing up in the valley and ideas they had to improve things there. For Cuyama Elementary School's principal, Rachel Leyland, who also works at Cuyama Valley High School as a counselor, inviting the students in that way represents a serious shift in the way Cuyama's youth engages with the community. "You know, these are students who don't usually get a chance to do public speaking," Leyland said. "They're English learners and aren't necessarily the first students to get picked to do that kind of thing, so that was important for me as a social justice type of thing. And they really did, they moved out of their comfort zone and spoke in front of all those people that night." 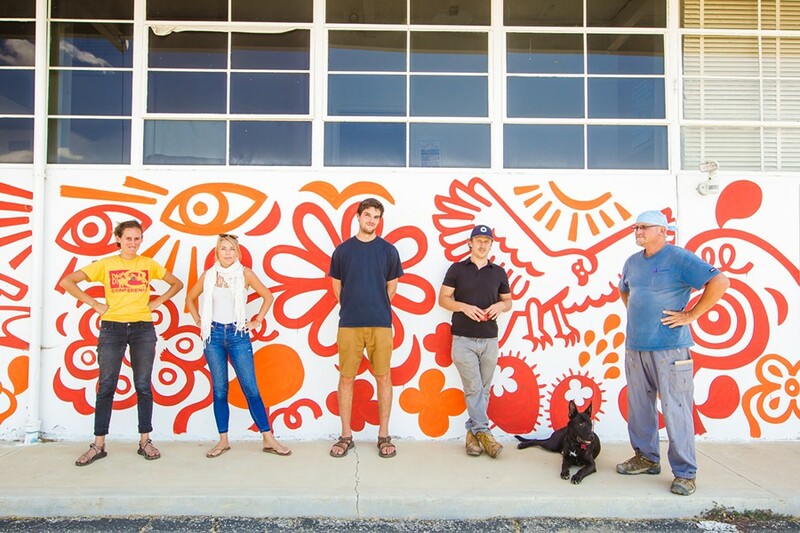 As Jankoski and Johnson see it, that's how an organization can inspire big companies, nonprofits, artists, and rural residents alike to collaborate together, by bringing everyone to the table to break both bread and barriers. The approach is what inspired companies like Duncan Family Farms to donate to Blue Sky, Calderon said. The farm and the center are working on developing an educational outreach program, he explained. 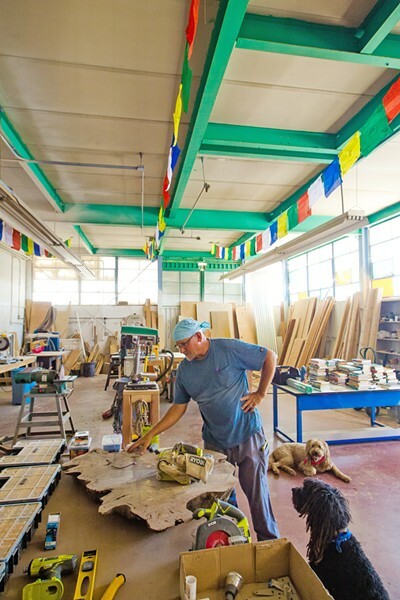 GROWING ORGANIZATION Chris Budny is the facilities manager at the Blue Sky Center in New Cuyama, where he does everything from tend the garden to rehabilitate industrial or office space for use by local organizations or entrepreneurs. One of Blue Sky's mantras is "equitable partnerships," which is illustrated in the AmeriCorps VISTA program's involvement with the center. Blue Sky benefits from their involvement there, and the young AmeriCorps volunteers also gain professional development skills and valuable experience right out of college. Another way the center tries to empower locals while also working to make the nonprofit self-sustaining is the space they rent to local businesses. They rent one workshop to an entrepreneur from Santa Barbara, who does screen-printing for T-shirts and posters. One New Cuyama resident rents garage space where he restores classic woody car bodies. Alexander Guerrero owns Warrior Wagons and has restored wooden car bodies and done custom work for decades now. He's able to work on cars "from all over the world," he said, thanks to having a workspace just a couple of blocks from where he lives. "They're giving me opportunity to get going at a low cost; it's not a lot of dollars out of my pocket to get this going, which is a major help," Guerrero said. "I live in the community, and they want to help the community, and this is their way of helping." Guerrero has so much to do that he also pays a part-time worker— another New Cuyama resident—to help him with the woodworking. Blue Sky's Facilities Manager Chris Budny is in charge of adapting the infrastructure there to be usable for entrepreneurs like Guerrero, but also for restoring office space and other areas to serve as space for the center's tourism aspect, for artists, and meeting areas for community partners. Budny also outfitted the canvas huts with their unique wooden furniture, like tree-trunk tabletops, working out of a sawdust-strewn shop that neighbors Guerrero's garage. "It's kind of the epitome of acting locally, thinking globally," Budny said. "Hopefully we can create something that's repeatable. There's so many entities out there that are trying to do things, but they just don't have the space or the money, but that's not really a problem here—we have the space, and we're pretty well funded." As the center moves forward with its mission of becoming self-sustaining while empowering the Cuyama Valley's economy and residents, everyday happenings mark slow, yet important progress. From planting trees to clearing out some more office or industrial space, or beginning to organize a farmers' market in the valley, it's all a step forward in the nonprofit's mission. For residents of the valley who also work to empower the community, like Cuyama Elementary's Leyland, the Blue Sky Center is a welcome ally in the quest toward a more prosperous rural community. "I was impressed by their sincerity and wanting to help in the valley," Leyland said. "I also liked that they really listened to the people here and it wasn't an outside entity putting their ideas on Cuyama, but rather it was, 'What are your ideas? What are your thoughts? How can we work in a partnership to achieve those?'" Contact the Sun's Managing Editor Joe Payne, from New Times' sister paper to the south, at jpayne@santamariasun.com. * Editor's note: This article was edited to correct the name of Erik Talkin.